WASHINGTON, DC, November 22, 2011 (ENS) – A federal judge Monday upheld the listing of Alaska’s Cook Inlet beluga whales as endangered, rejecting a bid by the state of Alaska to overturn the listing by the National Marine Fisheries Service. “More than a decade later, and despite the passage of a legislative moratorium on subsistence hunting in 1999, the population of Cook Inlet beluga whales has failed to show any appreciable signs of recovery. For this and other reasons, the National Marine Fisheries Service granted a petition to list the species as endangered under the Endangered Species Act,” the judge wrote. In his decision, Judge Lamberth explained that to determine the probability of extinction, the Service developed a time-series model that extrapolated the negative population trend observed in Cook Inlet over 50, 100, and 300 years. “The most realistic model resulted in a one percent risk of extinction in 50 years, a 26 percent risk of extinction in 100 years, and a 70 percent risk of extinction in 300 years,” the judge wrote. The State’s six-count complaint alleges that the Service failed to consider the relevant statutory factors and did not conform to the required procedures for making a listing determination. Judge Lamberth rejected those claims. The Alaska Center for the Environment, the Center for Biological Diversity, Cook Inletkeeper, Defenders of Wildlife, the Natural Resources Defense Council, and the North Gulf Oceanic Society, represented by Trustees for Alaska, intervened in the lawsuit on the side of the federal government to defend the beluga listing against the state’s attack. While there are four other beluga whale populations in Alaska, Cook Inlet belugas are a genetically unique and geographically isolated population of whales and are considered a “distinct population segment” for listing purposes. 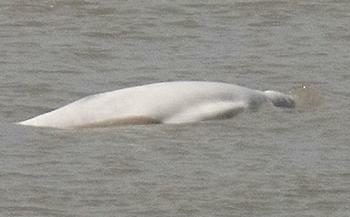 “Today’s decision again clarifies that the belugas are in serious trouble. Now it’s time to get serious about finding solutions. Legal sideshows by the state are getting us nowhere,” said Sue Libenson, executive director of the Alaska Center for the Environment. Thirty years ago, the number of beluga whales in Cook Inlet, a glacial fjord stretching 180 miles from Anchorage to the Gulf of Alaska, likely exceeded 1,300, but now hovers around 350. The whale’s population decline has been so severe that in 2006 the International Union for Conservation of Nature placed the Cook Inlet beluga on its Red List of Threatened Species. The U.S. Marine Mammal Commission repeatedly requested that the Fisheries Service list the species under the Endangered Species Act. Shortly after belugas were listed as endangered in October 2008, then Alaska Governor Sarah Palin announced plans to sue over the listing. When Alaska Governor Sean Parnell replaced Palin, who quit in the middle of her term, it was July 2009, and the new governor carried out Palin’s intent to block protections for the Cook Inlet belugas. In addition to this lawsuit, on December 1, 2009, Governor Parnell objected to the National Marine Fisheries Service proposal to designate more than one-third of Cook Inlet as critical habitat for the endangered beluga whales. But the National Oceanic and Atmospheric Administration has since designated 3,016 square miles of marine and estuarine environments considered by scientists to be essential for the whales’ survival, including all upper portions of Cook Inlet, where whales concentrate in summer months and mid-Cook Inlet. These areas contain important biological and physical features for these cetaceans, such as feeding areas near the mouths of salmon streams.